Family Volley: Maturation, Communication, and "The Secret to Happy Families"
Maturation, Communication, and "The Secret to Happy Families"
Tomorrow our son attends Maturation. Yep, 5th grade Maturation. Do any of you have kids who have already been there and done that? I remember when I had to attend maturation. My parents rarely went out of town when we were kids. But this particular time, they happen to be in England for two weeks. My great-grandparents came to watch us. I had to bring the permission slip home to my great grandmother for a signature if I wanted to attend. It took me three days to bring the subject up with her. I didn't know if I wanted to go or not. I just remember tears and stress because I didn't want her to go with me, but I didn't want to go alone. I just wanted my mom. I ended up attending the class alone, and everything worked out just fine. I realize in hindsight there was one main reason things worked out. My parents had already started the conversation with me about maturing and the birds and the bees. When they came home from the trip, we sat down again and continued the conversation. My husband had a completely different experience. His mom told him some false information, in order to avoid talking about touchy subjects. As young kids do, he believed her. One day while having a conversation with his friends, the topics came up and my husband told his friends what he "knew". They laughed at him and told him he was wrong. He defended his mom insisting she was right, until another parent stepped in, to set the record straight. My husband was so embarrassed! Needless to say the experience violated trust and affected future conversations and experiences between the two of them. We all talk to our children every day. But talking to them is so much more than conversations about schedules and sibling conflict. Successful communication means we are having a series of talks. We are starting conversations that continue over weeks, months, even years, in preparation for what they might face, and what life will have in store. This doesn't just apply to difficult topics like "maturation." This can apply to everything. Talking also means telling stories about ourselves. Positive stories that help teach our children, and help them relate to us. Growing up, my dad always told us stories about when he was growing up. He used stories to relate to us, teach us, and inspire us. I LOVED it. I think about his stories often and appreciate that he tells them to our children. They are being passed down through the generations and continue to bond us together through the ages. It seems that most, if not all the lessons and principles I was taught as a child, were taught through stories. My husband and I took a challenge not too long ago to work harder to share more personal stories with our children. Inspired by the thoughts of Bruce Felier in his new book, "The Secrets of Happy Families" we have set out to create a family narrative in our home so our children know our family history and know more about us. We have tried to focus on stories about our successes, and how we have overcome setbacks and challenges. Last month when our son brought his maturation permission slip home, we sat down to chat. With a renewed dedication to our family narrative, I told our son about the experience I had with my great grandparents when I was in the 5th grade. We laughed a lot and he gave me that shy funny look he delivers where his eyes go up and his mouth turns down. I told him how I was able to over come a difficult situation. Our children want to know about us. They want to hear our stories. They find strength in being able to relate to us and find similarities. It is comforting when they can realize that we were kids once too! We have seen our family relationship strengthen as we have worked harder to weave stories into our conversations and communication. It is a good challenge for all of us. Tips to having your own "conversations". Start early. Open the lines of communication when they are very young so they always know you can talk together about everything. Children will be prepared when situations arise and we won't feel like we are always playing "catch up" with our conversations. Remember, communication is more than just one talk. It is a series of dialogues, an ongoing conversation. Share stories with your family. Focus on sharing positive experiences. Sharing stories about challenges are also great, just be sure you focus on how you overcame the challenge. There is room to talk about mistakes also. Focus on how you fixed the mistake, learned from it, and righted the wrong, more that the actual thing you did wrong. There are some things we don't need to tell our children. Think twice. Research suggests that the more children know about their parents and grandparents, especially their successes and failures, the more they are able to overcome setbacks. Start creating a family narrative in your home today. Has your child gone to 5th grade Maturation yet? Do you tell your children stories about you growning up? Over the past two years of so, I have been able to participate in the TLC Book Tours. Every book I have reviewed has been fantastic. 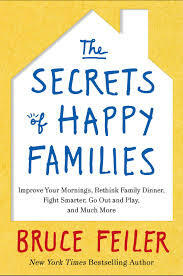 This last read was The Secrets of Happy Families by Bruce Felier. After 3 years of research, Happy Families aims to share some innovative and less traditional ways of bringing families closer together. Following along on Facebook and Twitter too! I was given a copy of the book to read. All thoughts and opinions are mine. This article happened at a great time, because my daughter has maturation today too! Thanks for the fantastic tips. I think I'm going to print out your bullet points and pull them out everytime I have a conversation with the kids. Great points to remember. "Our children want to know about us. They want to hear our stories. They find strength in being able to relate to us and find similarities." So true! And both my husband and I are doing everything we can to keep the lines of communication open between our son and us, though I'm sure there are tips in this book that would help us. My parents never had "the talk" with me. Ever. I found out everything I knew from school, friends, books, whatever. I don't feel like that's the right way to do it, and my eight year old has been asking questions so a few weeks ago my husband and I sat and talked with him about the basics. The best part was when he looked at us and said "Did YOU guys do that?" So funny. But we stressed that this isn't really something we talk about with little siblings or friends at school, not because it's bad but because it's special and private. He seemed to take it all in stride and I was super nervous for nothing. If nothing else, at least he knows we are willing to talk to him about this kind of stuff. drofemospelltemple@gmail.com his hot line +2348163387496 or his Via web sit http://drofemospelltemple.wix.com/dr-ofemo. Hello everyone,My name is Tina Grand.i am here to share my testimony on how i conceived my baby. I have been married to my husband for 3 years without no child. We have been to the doctor and it was confirmed that the both of us are in good condition. I had problems with my in-laws because of the child issue. I was introduced to MAMA DADA HERBAL HOME by a friend who lives here in America. I contacted her and explained my problems to her.MAMA DADA HERBAL HOME told me all that is required and i did it accordingly. I was very surprise to test positive after 2 weeks of contacting her. I gave birth to my baby boy four weeks ago and i am a very happy woman and a living testimony of this good work. Anyone who needs her help should contact her through Email. (mamadadaherbalhome@yahoo.com) and you will also testify to her good work. Wow so excited for what this great man did for me in helping me to get conceive a baby of my own after been married for the past years of no child but since i met this man online my problem is now solve and am now pregnant with 4 months pregnant and am so excited to be in this mood which i have been looking for in a long time now and i thank God i met this great man on time who solve my problem contact him on priestonomeherbaltemple@outlook.com for your solution too.